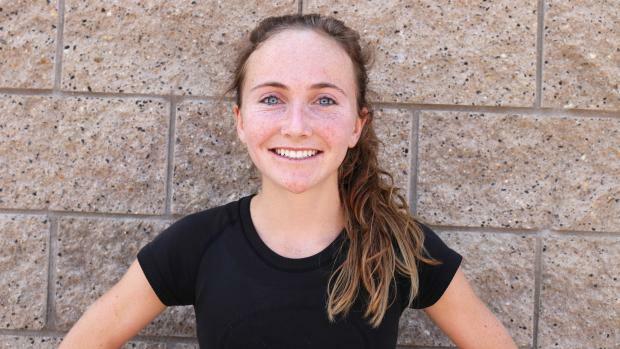 La Costa Canyon senior Kristin Fahy is one of the top distance runners in the country. CARLSBAD -- With a little over a mile remaining, La Costa Canyon's Kristin Fahy went by the huge crowd at the bottom of a small hill at the 2-mile mark, running smoothly, apparently on her way to victory in the Division III race at the CIF-State Cross Country Championships at Fresno's Woodward Park. A half-mile later she didn't need to see the look on her dad's face to know she was in trouble. "I had slowed down, I was not myself," said Fahy who, just before crossing the road onto the grass for the final straightaway, fell down, made one futile effort to get up, got knocked back down, this time staying on the ground as 208 runners flew by. Under results, she is listed as "DNF" -- did not finish. "I'd had problems with my IT Band the whole season," Fahy explained about a band that runs from the outside of the knee to the hip. "When I ran, it didn't bother me but I cut back on my training (the last three weeks). I don't think I knew how much it affected me until then. "I remember the week before, (teammate) Jessica (Riedman) fell just before the finish line in the section meet. Coach (Bill Vice) was right there when I fell at state but I just couldn't get up." Riedman came by a less than a minute later and couldn't believe her eyes. "Seeing someone like Kristin on the ground, someone who never shows pain, the first thing you want to do is help them up," said Riedman. "But you can't be that heroic person because you'd be disqualified and then you'd hurt the whole team you'd been training with all year. "The second thing is you want to finish as high as you can to help the team. I was really tired and when I got to the finish line I collapsed like the week before. "The amazing thing was we never saw Kristin break down. She was quieter than usual on the bus ride home and you could tell she was disappointed, but she was so strong." At the San Diego Section Finals the week before, Fahy had no problem motoring over the challenging Morley Field course, winning her second consecutive title by almost a minute in 17:10.4. The difference was, that course was 2.96 miles and Woodward Park is 3.1 miles. Had it been 2.96 miles, she might have finished before collapsing. Vice said he just hoped Fahy could hold on to finally give the school a title after four second place finishes. "I saw Kristin sagging and I shouted to her to slow down, to walk-anything to try to keep going," said Vice. "But when she went down and struggled to get up, I saw there were people there to help her and I knew she'd be OK, so I had to turn my attention to the other runners. "I went over to her in the ambulance but what do you say? I told her I thought we'd made the podium (top three teams) and I thought I saw a little smile." Less than an hour later, Fahy joined her Mavericks teammates on the stage to receive a medal for finishing third. She smiled but afterward was clearly devastated. She knew had she finished-even in the top 40-the Mavericks would have won the team title. But Kristin Fahy, like her highly successful brothers Steven and Darren, is a runner. So after getting the acidic disappointment out of her system, she went right back to what she knew would be therapeutic-training. She tried running the Footlocker West Regional and was in seventh place starting up the final hill when she just stopped. No falling this time, she knew exactly what was wrong. "My IT Band was killing me," she said, "and that course was just terrible for that kind of injury." Among experts, now, there was the question if she might have some psychological damage from failing to finish twice. They didn't know Fahy. Once track started, she was the same runner, only faster. That IT Band still bothered her but she captured the San Diego Section 3,200-meter title and at the State meet led for much of the race before finishing fourth in 10:16.44. That was a six-second improvement which any other year would have been a section record. However, a month earlier teammate McKenna Brown had beat her to the punch, clocking a 10:15.97 at the Escondido Invitational. When interviewed a couple weeks ago following a morning practice, Fahy -- who said she has yet to decide on a college -- is back training and reports there is no longer pain in her IT Band. The incident is old news, ancient history. This year -- scheduled to begin Saturday at the Bronco Round-Up at Kit Carson Park in Escondido -- she just wants to stay healthy. With teammates like the versatile Riedman (16th at state in XC and one of CA's top 800-meter runners on the track), last year's frosh-sensation Sydney Weaber (29th at state) and steady Natalie Schroeder (the 11th place finisher in Division III), Fahy is hoping the team can make another run at a state championship, this time in Division II. After that recent practice, Vice was gushing about how well both boys and girls teams were training, especially the girls. "Kristin and Jessica, of course, were out there but six of the others were right there together," said Vice before catching himself. "You just never know what might happen, though." Vice remembers how the Mavericks had the state team title locked up last year until he watched his star go down. Indeed, you never know.